Cockney born hair dresser - "a rock star, an artist, [and] a craftsman who 'changed the world with a pair of scissors." Vidal Sassoon, CBE has died aged 84 in his LA home after a long fight with leukaemia. There has been a massive, inspirational response to the child of Eastern European immigrants, born in Hammersmith who turned into a legend, carving the way to stardom with nothing more than a pair of scissors and the spirit to fight for what he believed was right. That spirit was encompassed by his joining the 43 group, a Jewish veterans' underground organisation at only 17 years old. Despite not being a verteran (or old enough tobe one) he campaigned to break up Oswald Moseleys blackshirts immediately after World War II. He went on to join the forerunner of the Israeli Defence Force, the Hagenah in 1948. 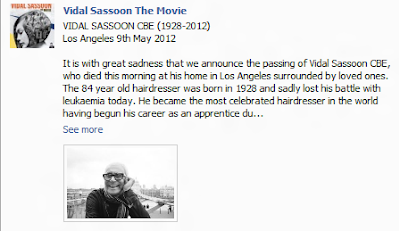 Sassoon returned to London, to train in Mayfair as a hairdresser. He opened his first salon in 1954, and the rest, as they say, is history. He revolutionised hair styles, and fashion through geometric cuts and the reliance on the hairs natural shine. Sassoon started the Vidal Sassoon International Center for the Study of Antisemitism in 1982, which researched information about antisemitism using a non-political ideology. He later went on to be involved in more charities, the Boys Club of America and the Performing Arts Council in LA, he supported these through his eponymously named Vidal Sassoon Foundation. Most recently, Sassoon has helped out in the aid effort after Hurricane Katrina and has set up training academies in England, the US and Canada - with plans in progress for China and Germany.